Inside a rehearsal hall at the Lyric Stage Company, two leading lights of Boston theater, Paula Plum and Adrianne Krstansky, circle each other warily but with growing affection. 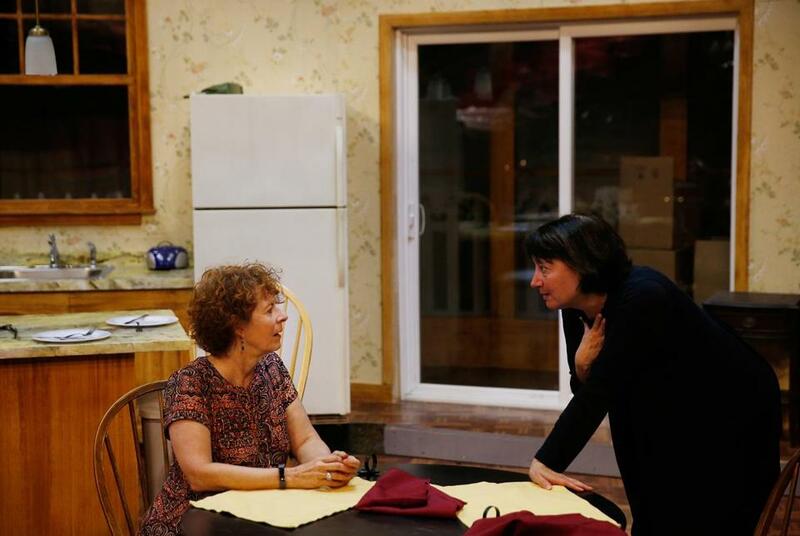 Playing middle-aged housemates Sharon and Robyn in Jen Silverman’s “The Roommate,” which the Lyric is presenting Oct. 19-Nov. 18, the actresses are bringing to life your quintessential odd couple, a mismatched pair who nonetheless have begun to tentatively bond. Robyn, a leather-jacket-clad lesbian slam poet from the Bronx with toughness (and secrets) to spare, has moved in with Sharon, a divorced Midwestern empty-nester who’s lived a largely sheltered existence. In the scene Plum and Krstansky are rehearsing, nosy Sharon, played by Plum, has snooped into Robyn’s belongings and is attempting to suss out why in tarnation her new roomie has so many different driver’s licenses and what tantalizing secrets she might be hiding. The persistent Sharon wants answers. At first, Robyn is irritated. “If you ask me that and I tell you, it makes you an accomplice, so you think about whether or not you want me to answer that,” she says, with a glare. “An accomplice,” Sharon replies, sounding intrigued by the possibility. As Sharon begins to learn more, she hops on Robyn’s roller coaster. Christopher Wallenberg can be reached at chriswallenberg@gmail.com.